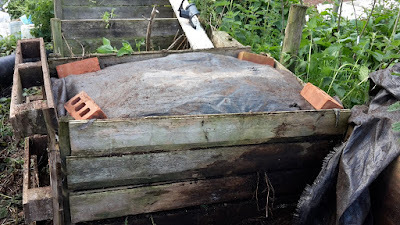 A couple of years ago I knocked up some compost bins from recycled materials and although I've been chucking all my compostable material into them I've not been great with the area as a whole. Weeds (nettles) had run rampant and it hadn't been turned. I decided to get in there and sort it all out. 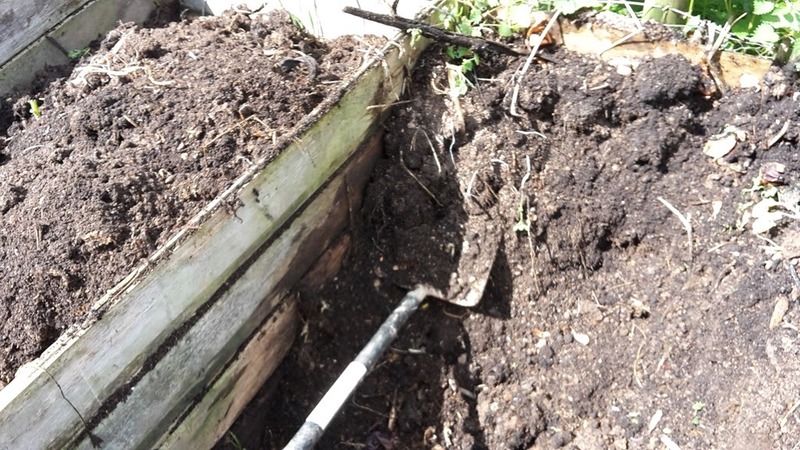 First job was to remove anything growing, then to get in there and turn the compost into the next bin. I was impressed with what I found. The stuff was beautiful, lovely, black and crumbly. Not quite finished though so putting it into the next bin for at least twelve months is the right thing to do. 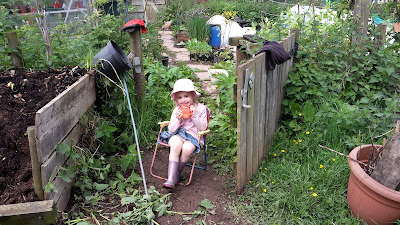 She's helping apparently, on "chicken Guard" to stop the hens getting in the garden. I then covered the full bin with black plastic, the end that was added is just a pallet screwed to the bin! Not wanting to wait too long to use some of that goodness I burnt a couple of holes in the top and planted a few winter squash in there (Oregon homestead sweetmeats - I'm really looking forward to trying these!) 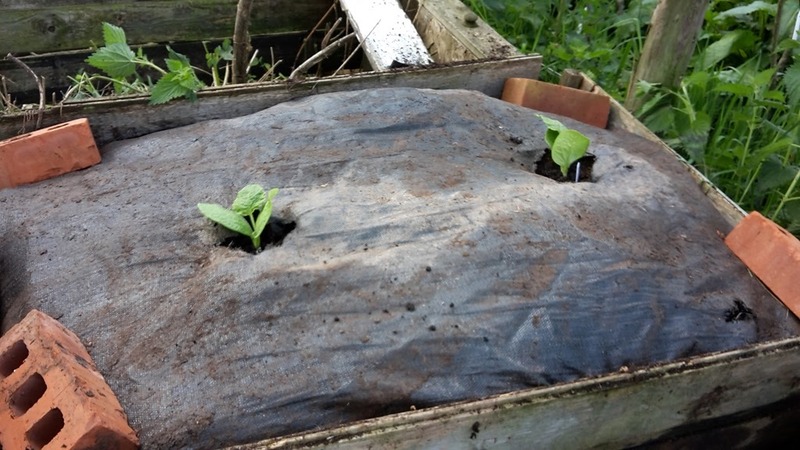 I've seen squash growing on compost heaps lots of times so I thought this might be a good way to squeeze in a few extra plants. It's still not quite frost free here (although I hope it is really) so I covered them with some make shift cloches, my wife had brought these umbrellas for a school project that didn't get used, I decided to use them in the garden straigth away, should give them a head start if nothing else. Since taking the picture below I've already half filled this bin. Looking at the two empty beds I decided to make a "wilting table" I got the idea from a Facebook group the other day (it was posted by Those Plant People) and straight away when I saw it I thought I could use one. 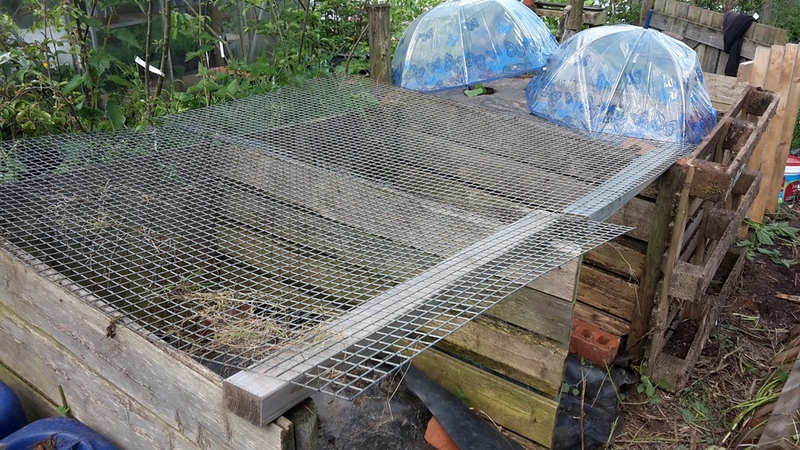 Rather than build something purpose made I found some weld mesh and some lengths of timber and laid it on top of the two empty bins. The idea behind this is you wilt the weeds and dry out their roots before doing anything with them. I'm not sure how well this works but I'm going to give it a try. I think once they're bone dry they shouldn't come back to life in the compost but I'll do a few experiments before I start chucking it in there. I'm planning on getting a few pallets that I've got around the place and making up another bank of compost bins at the weekend. I can certainly fill them pretty quickly and I have the sheep shed to muck out soon. Last years muck is in a pile but I don't think there is much of it left as it seems to disappear, keeping it enclosed should mean I get to use more of it where it's needed! How much compost do you make? 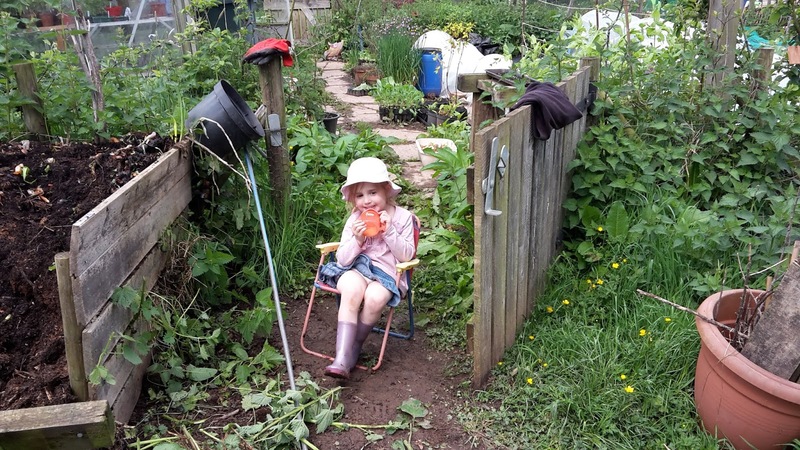 How organised is your compost area? Have you ever used a wilting table? Martin built me a set of three rotating compost bays, animal bedding and house waste hoover contents lawn clippings all go into it, everytime something is added it get turned, mixed in and breaks down fairly fast, I did see the wilting table and thought in our climate chopping the weeds would help them dry out quicker . 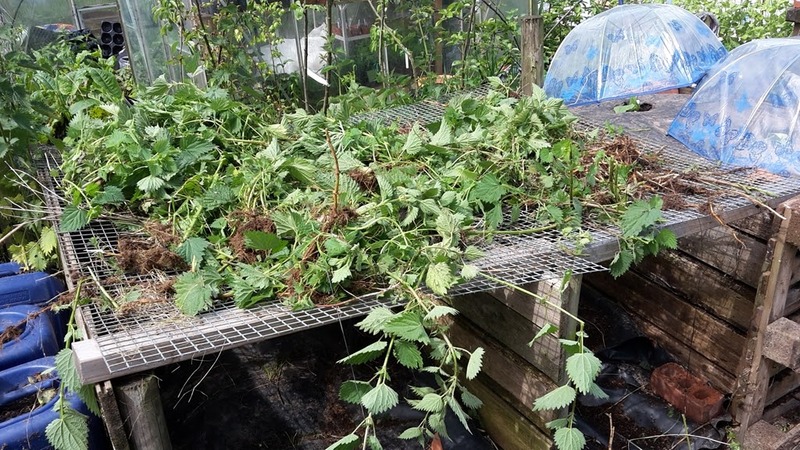 An Allotment neighbour spreads outs his worst weeds on a rack right next to the sunniest window on the greenhouse staging. They shrivel very quickly - I suppose a heavy duty cloche would do the same job. Chopping them would help I guess, anything to make them smaller to dry quicker and break down quicker when they're in the pile. I'm really going to try to produce a serious amount of compost this year and try a few different things out. 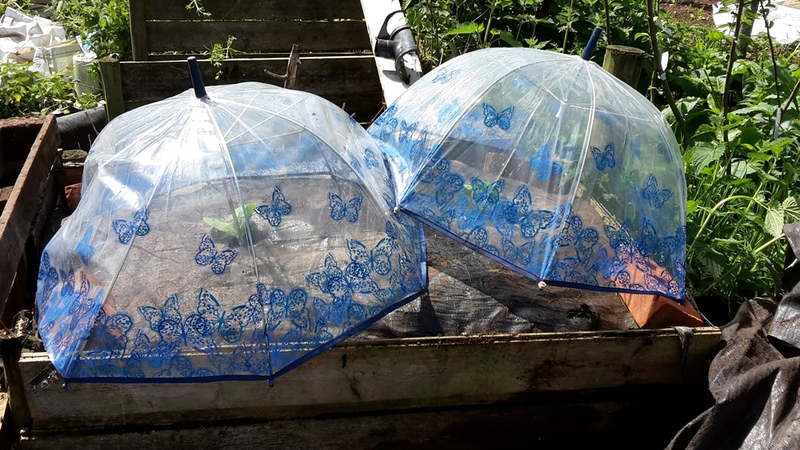 I like the idea of the cloche, I have an old window I could put above but I'd have to make a frame for it (not going to happen at the moment but maybe a job for the winter). On my Allotment I've got two large bins made from pallets & make several bin loads every year. As soon as one bin is mostly filled, which happens very quickly with veg trimmings & weeds, I turn it into the other bin which is emptied a couple of months later. 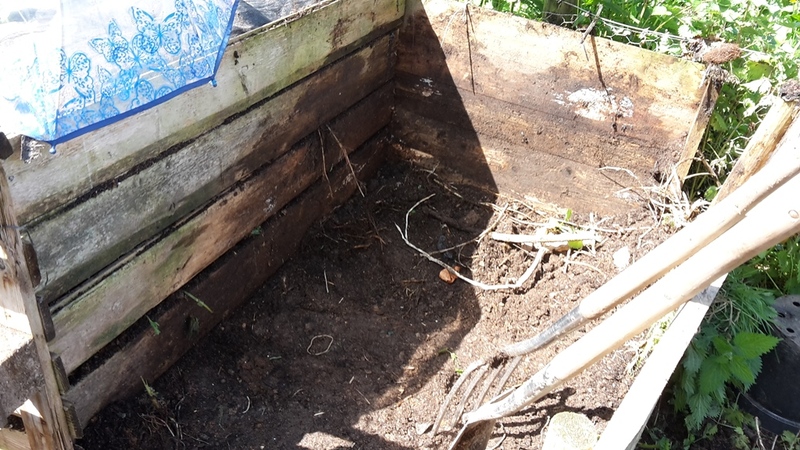 The compost is not perfect (it needs more turning for perfection - a 3rd bin would help), but I rake out the biggest bits & put them back, the rest makes a good mulch. If you have access to fresh manure & straw/hay, you could make a hot bed. These really extend the season. 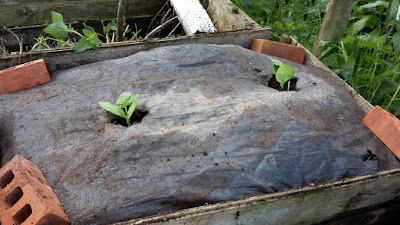 An Allotment neighbour gets interesting crops from his cloche-covered hot bed all through the winter & melons in the summer. I never seem to get manure at the right time to try hot beds, although I'd love to do it. I have this bank of four bins but it's not enough for how I'm gardening now, I need a bigger area to store more. I'm thinking of a little covered bin to keep a bale of straw to add a thin layer every now and again as I build the pile up. I have two of the plastic compost bins. 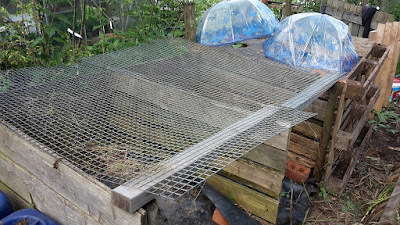 After I had added to one for a year or so I gave it a good turning over, took out anything that hadn't rotted down and then transferred the good stuff into the second bin (thanks Dawn) I add the chicken clean-out stuff to it along with kitchen raw waste. I don't turn it over as much as I should but perhaps I will do now it has been discussed. Thanks. I have a couple of those bins and use them for "naughty compost". That's things like docks that have gone to seed and other weeds. 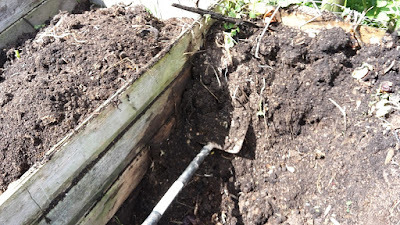 Then if I plant something deep the resulting compost can go in the bottom. One of my favourite tasks during the summer is when one crop is finished and I dig in compost to re-invigorate the soil for the next. I've got light sandy soil so I need lots of bulky organic matter to give it some body. I've used corrugated steel sheets to make five bays 6'x6'x4' high with 4" square posts for support. It keeps everything tidy and organised. One bay is just for leaves which I rake up each autumn. In the others go manure, chopped straw from the poultry bedding and vegetative matter. This makes a good mix and can generate a lot of heat. When I'm passing I often pee into it too. My soil doesn't take much improvement to become really good soil, I've added quite a bit of manure over the last five/six year though and you can tell. Each year I say I'm going to collect leaves then never do, it's a real shame as I have some huge trees on my lot and I bet I could make loads of leaf mould that way. i have bedding from the chicken adn the sheep but it's not very heavy with manure but ti should add something good to the pile. I also need to scoop up last years sheep bedding as I made a pile in the field and now it's getting thinner and thinner so it'll probably disappear and I won't get to benefit from it if I'm not careful! Another job for the weekend! Using those umbrellas to cover your plants was brilliant!! We too have compost pile which we did not turn this year but will begin doing so this summer. Every day though the chickens did jump up in their, pick out what they wanted and then leave some of their own little gifts. I need to do a post on that too if you don't mind me copying you! I feel so unprofessional now. I literally just chuck stuff across the garden all winter and then till it under in the spring. That's how my grandfather did it and my mom's compost bin never got hot enough to kill weed seeds. 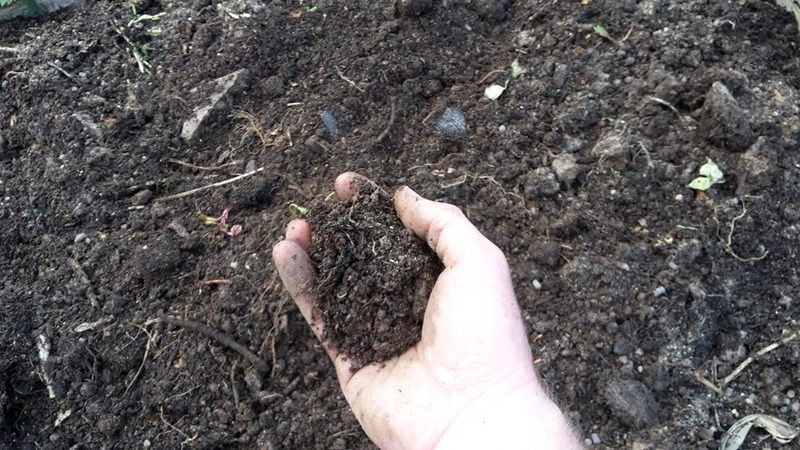 During the summer all compostables that seem remotely edible are chucked into a corner of the chicken yard, they scratch through it and what they don't eat the bugs will. Then the chickens eat the bugs. I know you "can't" feed your poultry leftover kitchen scraps but I think mine would die of sadness if these treats stopped showing up. Later the chicken poo gets put on the garden too = win for everyone.